You might think that the historical marker on top is older than than the one below it, but actually the reverse is true: The sign on top is a replica of an earlier 1964 sign, placed in defiant counterpoint to the newer marker that recently replaced it. Do we have a clash of narratives? Much of this area's early history occurred on nearby trading posts and settlements, which lived and died leaving little trace of their existence. Such was the post built one mile west by Maurice Leduc in the 1830s and the village of Hardscrabble established in the 1840s by traders and trappers below the fork of Hardscrabble and Adobe Creeks. Hardscrabble's walls and flat-roofed adobe houses formed a protective square in the middle of county long fought over by the Ute and Arapaho Indians. Villagers traded with anyone who happened by, but the tiny community was too far removed from the main-traveled Santa Fe Trail to survive. By late November 1848, when John C. Fremont and his men briefly visited Hardscrabble on their way west in search of a central railroad route through the mountains, the village was almost deserted. 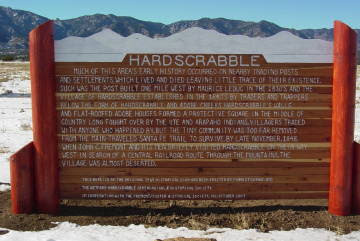 The newer (non-replica) sign's text owes a debt to the late Janet Lecompte's book, Pueblo, Hardscrabble, Greenhorn: Society on the High Plains, 1832-1856 . It includes a sketch and brief biography of Teresita Sandoval, who was clearly the femme fatale of Fort Pueblo, "willing to share the drudgery and terrors of frontier life with her man--until a man she liked better turned up," as Lecompte describes her. 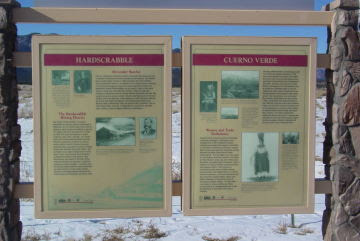 The replica sign is the work of the new Wetmore-Hardscrabble Historical and Genealogical Society, also responsible for signage at the so-called Kit Carson Rock. Do they find the new text too "complicated," or do they just miss the familiarity of the old sign that stood for forty-plus years? In his book The Past is a Foreign Country , David Lowenthal writes, "Viewing the past as wholly ideal, the traditionalist seeks refuge in mystical connection with his great and ennobling heritage, but is partially absorbed in and subconsciously attracted to the new influences he affects to despise." Labels: Custer County, history, Wet Mtns.